A founder asked me recently if there were any trends in professional services across public SaaS companies. I had examined the gross margins and share of revenue from professional services about 3 years ago. Professional services are consulting fees software companies charge to customers for software configuration, customization and education. What has changed over the past 3 years? First, we have more comprehensive data set, since many more companies have gone public. Second, many newer software companies generate substantial fractions of their revenue from PS. Appian is close to 50%; Pegasystems is at 37%; Horton is at 24%; Mulesoft at 20%. 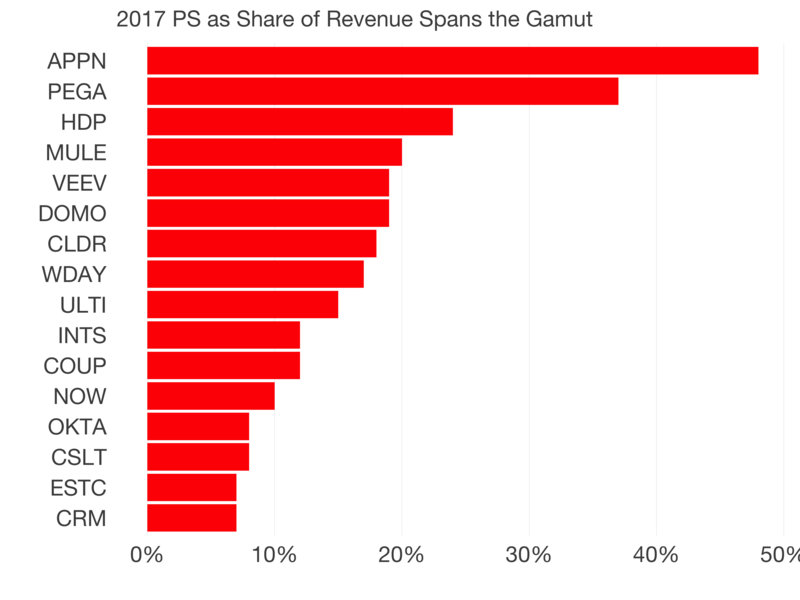 In the past, companies with higher professional services components to their revenue have been valued less highly because PS revenue isn’t recurring and is lower margin than software revenue. In addition, the gross margins from professional services look different than three years ago. The variance is much higher. One one hand, Domo earns 41% of gross margin on their service; while Castlight operates a -72% gross margin PS business. While the average may be zero, that figure doesn’t capture the reality. 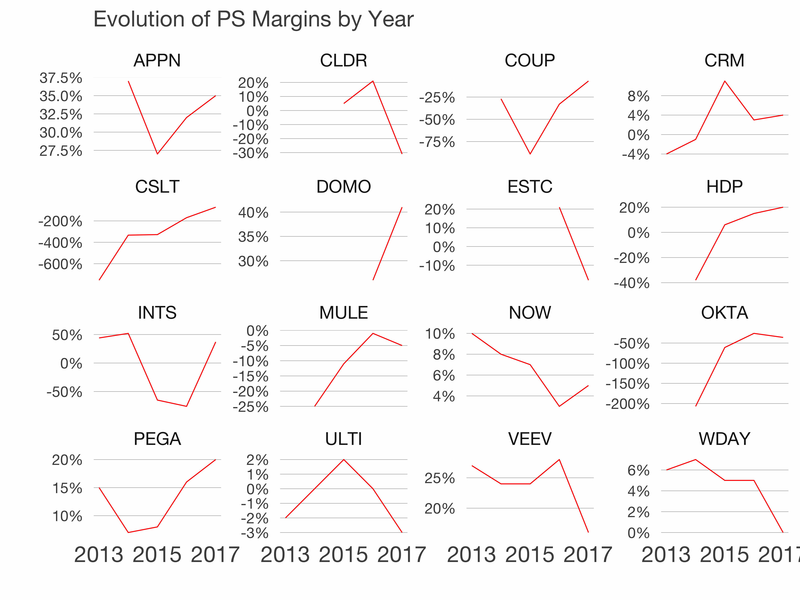 Across all these companies, PS sees a fair amount of variance year by year. It’s difficult to project how much services revenue a company will book in a year. Staffing can be tricky. Hire too many people and your margin declines. Hire too few and you may not be able to on-board all those customers your sales team wants to close. As more companies go public, we observe many more models for deploying software at different price points, sales motions and fulfillment motions. This professional services data underscores that point. 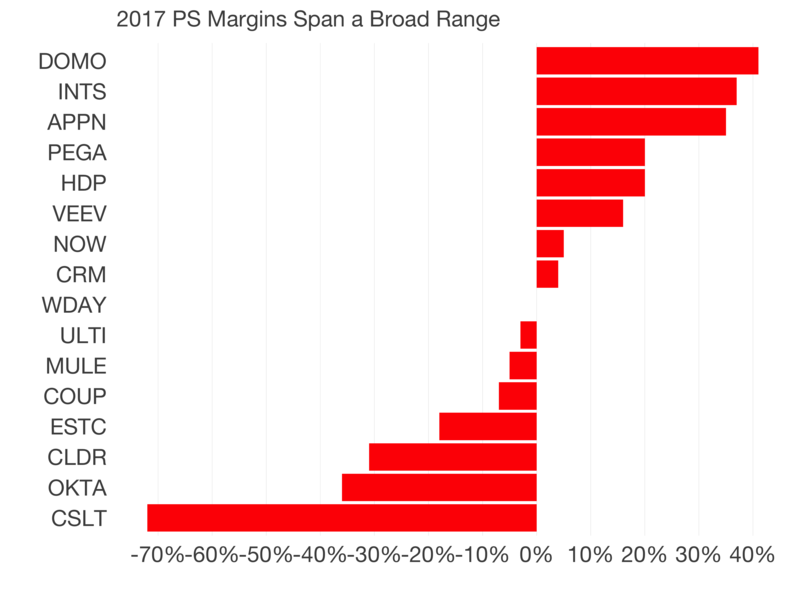 There are companies making healthy margins on PS, while others basically give services away. There are companies who use PS to win business and those who prefer to minimize services by either outsourcing it, or focusing on customers who don’t require it.